✅ EASILY IDENTIFY YOUR LUGGAGE - Save yourself the energy of searching among tons of luggage at the airport terminal with a premium 2-pack luggage tag set . The pale blue frame around your ID information card makes an eye-catching, easy to spot luggage identifier that will stand out among the many similar dark colored baggage tags at crowded airports, ports or bus stations . It is a high-end tag set, approved on any airplane flight, airport or airline crew around the world . ✅ THE LAST SUITCASE TAGS YOU WILL EVER NEED - Forget all about poorly crafted luggage name tags with the flimsy stitching that gets ripped after a while . Made of thick, durable PU leather, with sturdy stitching and strong tag holder straps, these luggage identification tags are made to last for much more than most similar baggage id tags on the market . ✅ SAFELY SECURED ON ANY TYPE OF LUGGAGE - The novelty extended design of the heavy-use tag straps and the reinforced zinc alloy manufacture of the tough buckles guarantee the longevity of a top quality product . Easy identification of your suitcase is now made a breeze, thanks to the long, adjustable straps that make this set ideal as a backpack, bag, airplane or cruise baggage tag set . ✅ A TREMENDOUS VALUE SET - Committed to your 100% satisfaction, we are offering you much more than most other suppliers of travel bag tags . Get your hands on a complete set of 2 heavy-duty bag tags with info card + 2 strong luggage tag holder bands + 2 e-Books with safety tips for your peace of mind on your traveling adventures . Don\'t miss out on a great value pack, offered as a token of our esteem to our valued customers . 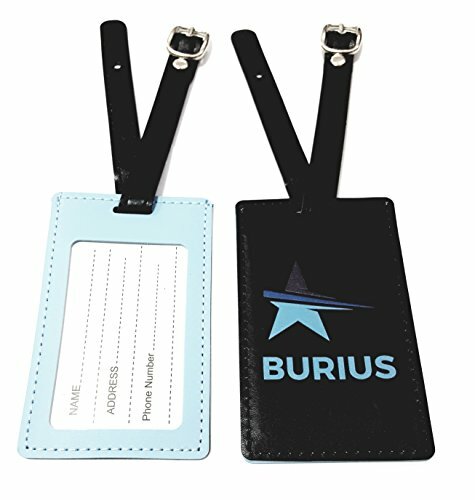 ✅ PREMIUM LUGGAGE IDENTIFICATION OR YOUR MONEY BACK - At BURIUS Innovations we take great pride in the quality and craftsmanship of our baggage claim tags and we are confident you will be thrilled with them. This is why we are backing our luggage tag identifier set with Full Refund Policy and the friendliest Customer Service, making your shopping experience absolutely RISK-FREE .